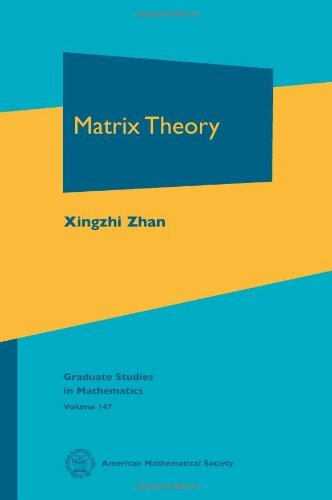 [PDF] Matrix Theory (Graduate Studies in Mathematics) | Free eBooks Download - EBOOKEE! Posted on 2018-01-04, by luongquocchinh. Description: Matrix theory is a classical topic of algebra that had originated, in its current form, in the middle of the 19th century. It is remarkable that for more than 150 years it continues to be an active area of research full of new discoveries and new applications. This book presents modern perspectives of matrix theory at the level accessible to graduate students. It differs from other books on the subject in several aspects. First, the book treats certain topics that are not found in the standard textbooks, such as completion of partial matrices, sign patterns, applications of matrices in combinatorics, number theory, algebra, geometry, and polynomials. There is an appendix of unsolved problems with their history and current state. Second, there is some new material within traditional topics such as Hopf's eigenvalue bound for positive matrices with a proof, a proof of Horn's theorem on the converse of Weyl's theorem, a proof of Camion-Hoffman's theorem on the converse of the diagonal dominance theorem, and Audenaert's elegant proof of a norm inequality for commutators. Third, by using powerful tools such as the compound matrix and Grobner bases of an ideal, much more concise and illuminating proofs are given for some previously known results. This makes it easier for the reader to gain basic knowledge in matrix theory and to learn about recent developments. No comments for "[PDF] Matrix Theory (Graduate Studies in Mathematics)".